Amartya Sen has a prominent place among the most respected contemporary economists. Winner of Nobel Prize in Economic Sciences in1998 he is a known philosopher too. His academic position at Harvard is 'Professor of Economics and Philosophy'. He was the President of the American Philosophical Association for a term. Sen was born in 1933 on the Campus of Santiniketan, founded by Tagore in West Bengal. His name Amartya was given to him by the poet Tagore himself. Sen says that his whole life he was living on university campuses. His Book The Idea of Justice, originally published in 2009, is an inter-disciplinary work, cutting across the borders of economics, philosophy, law, ethics and literature. His writings are of interest not only to professional economists but also to philosophers, jurists, political scientists, social thinkers, theologians and intelligent lay readers. They may be of special interest to the Indian intellectuals and students because of his acknowledged cultural roots and his frequent reference to Indian classical spiritual-philosophical sources. He draws inspiration from the ancient Upanishadic and modern Indian literature in order to develop his seminal thinking in economics. (He still holds an Indian Passport, though he became the first ever Indian to become the Master of Trinity College, Cambridge, in fact, the first Asian to hold that position in any Oxbridge college. He relates an interesting incident in this regard. While being Master of Trinity College and a well known personality, he was once returning to England from abroad. The British immigration officer at the London airport, examined his Indian passport with the usual suspicion, and without recognising who he was, asked his address of stay in England. Master's Lodge, Trinity College, Cambridge, said Sen. The immigration officer then condescendingly and probably with a bit of sarcasm said: O you must be a friend of the Master ! Sen doesn’t tell us what his response was. He simply takes off with a philosophical question, "Can I be a friend of myself ?" and then he goes on to discuss the whole complex issue of identity in our world today). In this brief talk on Amartya Sen's reputed work The Idea of Justice (Allen Lane, 2009) we shall focus mainly on its philosophical- ethical aspects with some random examples. Like in most of the modern intellectual-academic disciplines brought to us from the west, the reflection on justice also has a long tradition of sustained and interconnected history, beginning with the great philosophers Plato and Aristotle. With later Roman jurisprudence and the Jewish biblical traditions of the Prophets who cry out for justice, a long line of thinkers inform the modern western concept of justice. In India political and social thinkers like Chanakya and Manu, and spiritual classics like the Bhagavat Gita and the great epics in general take up the question of justice but in different way. Amartya Sen has inherited both western and Indian traditions because of his academic training and his teaching career both in India and England. Sen generously acknowledges his deep connection with his preceptors and colleagues in his reflections on justice. The name of John Rawls is the most prominent, because his one time colleague and the Nobel Prize winner Rawls' book, The Theory of Justice is taken as a springboard for Sen's own work. The book is dedicated to John Rawls who defines justice as 'fairness'. Sen is respectfully critical of his senior friend and colleague who had a vision of a perfectly just society with its perfectly just institutions of governance. For Rawls this ideally just order of society would be the unique criterion to measure all policies and positions in a socio-political set up. Sen argues that there are plural and competing reasons for justice which make it difficult to take an impartial decision that is fair to all. He gives us an example to illustrate this. Three children, Anne, Bob and Carla, are quarrelling over the ownership of a flute. There is only one flute and everybody makes a claim on it. Anne says, she is the only one among the three who knows how to play a flute, and so she should get it. Bob says, he is so poor that he doesn't have the means to buy a flute and so he should be given the flute. Carla says that she actually made the flute with her own hand and so she is entitled to own it. Each one is right as far as the fact of the claim is concerned. We may have any number of people who would be exclusively supporting anyone of these claims against others. Utilitarians would argue that a flute should be given to the one who knows how to play it. What else is a flute for? The economic egalitarians would support Bob by arguing that he is really poor while the other two are rich. He has no other toys and it is only just that he be given the flute. Libertarians and labour rightists would argue that the flute is the product of the hard labour of Carla and so she has the right to own it. Sen says, that one cannot brush aside any of these arguments. They are based respectively on human fulfillment (Anne), removal of poverty (Bob) and the right to enjoy the fruit of one's labour (Carla). No judge can be fair and just here without being arbitrary. The question Sen raises is about the principles underlying the allocation of resources in general. It is about the social arrangements, social institutions, and social realizations in connection with justice. Whatever theory you adopt, "there may not indeed exist any identifiable perfectly just social arrangement on which impartial agreement would emerge" (Idea..p. 15). Amartya Sen here draws from the classical Indian literature on ethics and jurisprudence. Both words niti and nyaya in Sanskrit can be translated as justice. He interprets Niti as standing mainly for organizational propriety and behavioural correctness. In contrast to this nyaya stands for a comprehensive concept of realized justice. All institutions, rules and organizations should be judged on the basis of the broad and inclusive perspective of nyaya, which is inevitably linked with the world that emerges, not just institutions and rules we happen to have. Classical Indian jurists spoke disparagingly about Matsyanyaya or justice in the world of fish. The bigger ones swallow the smaller ones. Our concern is that justice in the human world should be different. If a big fish could still devour a small fish at will despite the properly established organizations then it is a gross violation of justice in the sense of nyaya. Sen takes the dialogue in the Bhagavat Gita between the Lord Krishna and the great archer Arjuna as carrying great significance for his thesis. Lord Krishna tries to persuade the reluctant Arjuna to take up arms and fight in the great and just war. It is Arjuna's duty, swadharma, and he is obliged to carry it out (Deontology in ethics). But Arjuna is recalcitrant. He doesn't want to kill his teachers and kinsmen on the opposite side (Consequentialism in ethics). He is deeply depressed but finally he is persuaded by Krishna's argument, and he fights. Amartya says, however, that the Gita is only one chapter in the great epic of Mahabharata. What is narrated at the end of the epic story is terrible and deplorable - women beating their breasts for the loss of their husbands, brothers and children, corpses lying around in a pool of blood… So Sen wonders, considering the ultimate consequence of the war: was not the reluctance of Arjuna to fight and kill wiser than the advice of the Lord Krishna to shed blood and eliminate the opponents? Sen stands for comprehensive consequentialism in matters of economic and political policies. Both the process and the far reaching consequence are to be seen together in view of human well-being. According to Sen, Public reasoning is central to the theme of justice and democracy. His earlier work The Argumentative Indian (Penguin Books, 2005) deals with this topic in the context of India. He says that we should avoid the two usual assumptions that democracy is a gift of the Western world to India and that there is something unique in Indian history that makes the country singularly suited to democracy (Ibid., p. 3). It is true that India's own tradition of "public reasoning and argumentative heterodoxy" are used in its option for democracy. The Indian form of secularism for example emerged in the context of this public reasoning and the argumentative tradition. Sen says that the classical tradition of India, particularly in the Buddhist stream, has many examples of public debate without animosity or violence to the opponent. The case of the emperors Asoka and Akbar are very instructive. They advocated mutual respect, restraint in speech and freedom of expression in a religiously pluralistic situation. It is the acceptance of the plurality of positions and perspectives that keeps public reasoning healthy and productive. Women's Participation in public Reasoning. The classical discussion in India in the assembly of scholars included women participants as well. Sen refers to the Brihadaranyaka Upanshad in which the great sage and unchallenged scholar Yajnavalkya is confronted by women scholars like Gargi in public assembly. Maitreyi, one of the wives of Yajnavalkya, discusses with him the ultimate meaning of wealth. She asks her husband if she would attain immortality with all her wealth on earth. He replies that her life would then be like the life of all rich people and that she would not gain immortality. Whereupon she asks: "what should I do with that by which I do not become immortal?". Sen says that it is this crucial question that motivated him to understand and explain the concept of 'development' in Economics that is not parasitic on notions like growth of GNP or GDP. As a young boy, Amartya witnessed the terrible Bengal famine of 1943 in which thousands of people died every week. Later one of his well-known theses was that famines occurred not because of the shortage of food. It was the absence of a functioning democracy with a government that is accountable to people, the absence of free and unbiased press, and inadequate communication and transportation facilities. The Bengal famine happened during the British Raj. The imperial media was biased and it underestimated the tragedy. The faraway rulers of India were never challenged and they never knew what starvation was. There was no substantial public discussion on the issue. Sen says that there is no case of any famine in a functioning democracy with a free press, public reasoning, and communication and transportation network. Another case is the women-men ratio in our world. No places women are favoured by nature over men. But in South Asia, China, West Asia and in some parts of India population of women is lower than that of men. Sen cites Kerala as an exceptional region where women are favoured. It is not poverty but other factors like the education of women, their possibility to work outside the home, their freedom to participate in public discussion, their capability to earn and be economically independent which are significant. With such capabilities women can care for female children and educate them in a manner that is not otherwise possible in some very traditional and conservative societies. Sen would insist that all public reasoning should go beyond the boundaries of a state or region. Other people's interests and perspectives can liberate us from a negative parochialism, and broaden our own investigations in favour of justice, globally and locally. In a globalised world interrelatedness of question of justice is to be recognised. Sen quotes Martin Luther King Jr. who wrote from the Birmingham jail in 1963: "Injustice anywhere is a threat to justice everywhere". In an intricately connected world like ours in terms of trade, communication and the whole cultural, intellectual, economic and information network, it is hardly wise to ignore the global dimension and remain within our parochial shell in matters of justice. Agreeing with Adam Smith, Sen says that "non-parochialism is a requirement of justice" (Idea… p.403). Public scrutiny even from a distance is important for justice. Examples like stoning of adulterous women in Taliban's Afghanistan, selective abortion of female foetuses in China, Korea and parts of India, use of capital punishment in China and USA are cited as examples which require open discussion and public reasoning beyond country or region or religion. Impartiality when it is closed to a particular society or country will not contribute to the central idea of impartiality or fairness constitutive of justice. The capital punishment as practised in the USA. Sen refers to the US Supreme Court majority judgement of 2005 against the use of death sentence for a crime committed in juvenile years even though the execution would take place after the person reached adulthood. There was however a debate on whether opinions from outside of the US system could be seriously considered. Sen thinks that though there is no such thing as a global community, the global public reasoning in such cases should be seriously listened to. Justice "must be seen by the eyes of the rest of mankind" as Adam Smith said. 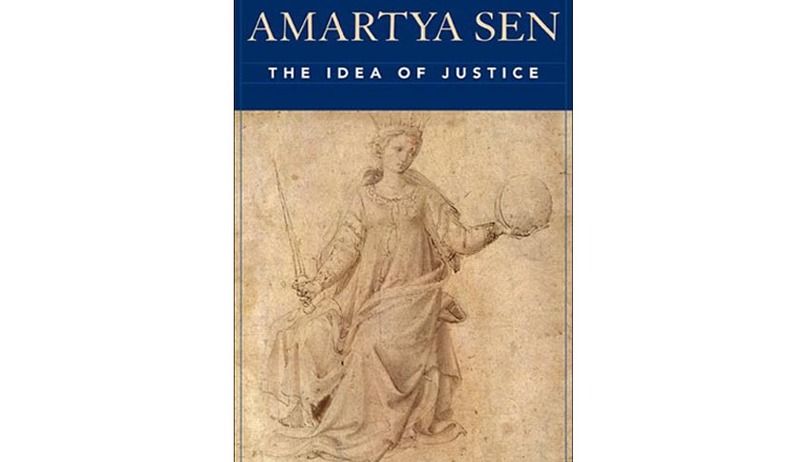 Let me finish my random reflections on Amartya Sen’s Idea of Justice with a few comments. 1. In spite of a vast array of theories of justice and ideologies that proclaim the goal of justice, injustice is still the major unresolved issue of our world. Fundamentalism and terrorism are on the rise primarily because there is injustice built into our present global culture. What we generally acclaim as global with approbation in cultural and economic domains of our world is really the exaltation and universalisation of the local, precisely the dominant Western culture. The oppressor and the oppressed are still there though under different garbs. Less powerful nonwestern cultures are acquired to be subservient to the dominant global culture. It is natural that there is resistance and reaction in different parts of the world. It seems these elements are not really taken into account in the concern for a theory of Justice in academic circles. 2. It seems we have put a lot of trust in the idea of progress, and we have measured progress in terms of the development of technology, economy and culture geared to a consumerist paradise. We have also tied the idea of this materialistic market progress to democracy, freedom and human rights. This linear monocultural material progress has not paid any attention to the plurality of voices coming from other domains of human life like values, spirituality, ethics and overall human concern for dignity and happiness. Sen correctly points out that the ancient ideal of happiness is still the goal to which social justice is directed. However the kind of progress we aim at and achieve does not produce any happiness superior to our previous modes of happiness. 3. The crisis in energy and environment is a fatal one as far as the future of our world is concerned. However, there is very little political public debate on these issues apart from some perfunctory discourse and policy-making. Some of the heated debates pertaining to energy and environmental issues that we have seen in our polity and society have been rather sterile and have not addressed the real problems relating to the impending energy and environmental crisis that we will be compelled to face in the very near future. In reality such discourses and policy making efforts have masked and bypassed the urgent questions about our energy and environmental crisis and the need for a firm future policy-making. 4. People world over are now living in an insecure world in spite of the tight security measures adopted by most countries. It is paradoxical that the more we increase the cost and equipment for security the more insecure people become. The only alternative is to foster mutual trust and transparency in interpersonal relations as well as in national and international relations. What we need for this is not high-tech organisations and a huge budget, but education in values of mutual respect between persons and committed compassion to the weak and the marginalised sections of society. 5. It is noteworthy that the political health of our nation still depends to a large extent on the health and integrity of our judiciary. When some of the very powerful yet unscrupulous lawmakers go to jail on criminal charges of violating the sacred trust that people put on them, we the people of India are once again reassured that the laws and the lawmakers of this country are subject to justice and not the other way around. Dr. K.M.George took his Master’s Degree in Philosophy and Theology from the Louvain University Belgium and undertook his Doctoral and Advanced Research programmes from the Sorbonne University Paris and Catholic University Paris (1972-77). He was formerly Professor of Theology at Bossey Ecumenical Institute Geneva and has also taught at Geneva University and Lausanne University (1989-94) and was Principal and Professor of the Orthodox Theological Seminary Kottayam.